Friction is a resistance cause by two objects dragging across each other. There are several types of situations that can cause friction. However, for right now I am only going to discuss dry friction, since this is most likely the type of friction that you will encounter in dynamics problems. When analyzing dry friction you need to realize the cause of friction is at the microscopic level. As a result if you drag two objects across each these microscopic imperfection will catch on each other causing a resultant force. In turn the rougher the surface the greater the frictional force. There are two basic types of dry friction; static and kinetic friction. First, let’s talk about static friction. Static friction is ability the object has to resist movement. Once a force that is greater than this force acts on the body it will start to move. On the other hand what happens once the object starts to move? Well, since you will still feel a resistance when pulling a moving object that means friction is still present. In this case it is kinetic friction. The force caused by kinetic friction is always lower than the force caused by static friction. There are three laws that describe dry friction. They are as follows. This means that applied load that is perpendicular to the contact surface will generate frictional force that is proportional to that load. This means that regardless of how large or small an objects contact area is the frictional forces will remain the same. -Coulomb’s Law of Friction: “Kinetic friction is independent of the sliding velocity. This means that regardless of how fast or slow an object is moving the force caused by kinetic friction will remain the same. A box is being pulled by rope. The coefficient of static friction is 0.26. The rope will fail at 450lb. How heavy can the box be before the rope fails? Step 1: Draw a Free Body Diagram to see how the forces are acting on the box. Step 2: Relate the frictional force to the force on the rope. As mentioned above there are other types of friction that can occur. They are as follows. Fluid friction is resistance between the layers of viscous fluid as the fluid is moving. Fluid friction is what creates boundary layers in a moving fluid. In addition, another type of friction is lubricated friction. 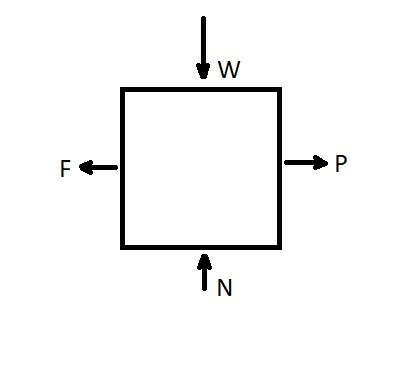 Lubricated friction is the resulting friction as two solid bodies move against each other when there is a layer of lubricant between the two objects. Skin friction is another type of friction which defines drag as a fluid moves across a solid bodies surface. Finally, internal friction is a force that occurs between the elements that make up a solid body as it is deforming. Looking at thermodynamics, as two objects move against each other the friction that they create will convert kinetic energy in thermal energy. In other words work is being converted into heat. This results in a loss in performance, since energy that was meant to be used for work has been lost to heat. Friction can also cause premature wear on parts. Due to these two facts it is best to try to minimize friction as much as possible. However, friction will always be present to some extent.